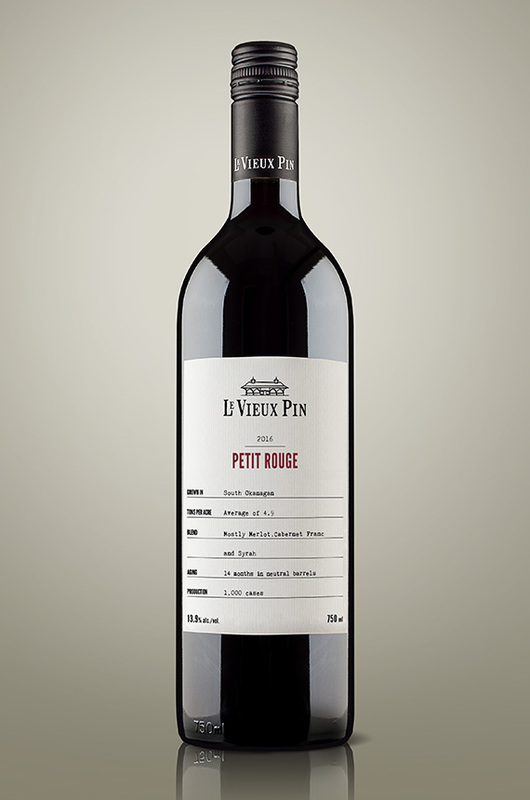 The inspiration for Petit Rouge is to make a wine that adheres to the same exacting standards and level of care as the rest of the wines at Le Vieux Pin, yet at the same time is more accessible upon release. Made from the fruit of younger vines and vines pruned and cropped at less stringent levels, Petit Rouge offers a big bang for your buck. This year’s blend consists mostly of Merlot and Cabernet Franc thanks to a gorgeously classic summer growing season with a balanced crop. Syrah, albeit in a smaller percentage as part of the blend, still makes its presence known on both the nose and the palate with that unique spice, purple flower, and peppery notes. The palate is lively and harmonious and a great balance of fruit, tannin and acid make this wine quite versatile and very food friendly. This beauty goes well with so many different dishes. While it is perfectly fine to drink on its own, it is at the dinner table with food that this wine will shine brightly. Pair with a variety of red meat, cheese, and casual favourites. This is compilation of merlot, syrah and cabernet franc aged 13 months in neutral French oak. There is a nice berry, peppery and herbality lift to the nose… not so ‘petit’ but it delivers well for the price. Very good length.